Hydrogen bombs lurking somewhere off Atlantic City, piracy on the Mullica River and World War I spying off Ocean and Monmouth counties are just some of the mysteries held under the waters of the Garden State. 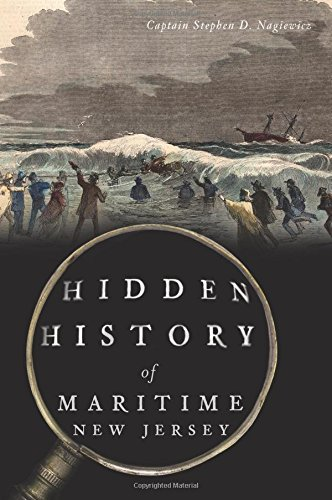 After decades of diving, researching and cataloguing, a Brick Township expert has published his first book, Hidden History of Maritime New Jersey, bringing together stories of tragedy, bravery and secrecy that can only be found deep below the surface. A lifetime of fascination with the sea – Capt. Steve Nagiewicz is also a renowned shark expert and professor at Stockton College – began early in life. “I first got interested in diving on my honeymoon, and I said, ‘I want to do this,'” he recalled in a recent interview with Shorebeat. The warm, clear tropical waters he experienced then would lead to a lifetime of diving in New Jersey’s murkier depths, which provided Nagiewicz with a heightened sense of curiosity about the history that has been preserved in the estimated 3,000 shipwrecks off the state’s coastline. 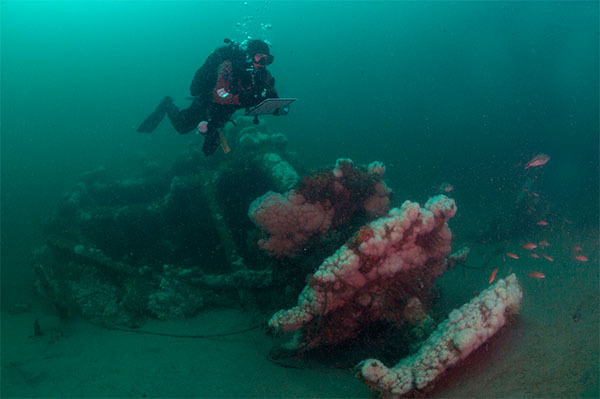 Nagiewicz, in the 1990s, created a site aimed at educating divers about the wrecks they would encounter off the Jersey Shore. As the years went on, he catalogued more information, visiting hundreds of libraries and museums, all in an effort to learn more about a slice of history which is rarely written down. “The research libraries like the Mariners Museum in Newport News (Va.) and another in Mystic (Ct.) are huge repositories,” Nagiewicz explained, adding that he was even able to identify some wrecks by visiting the archives of maritime insurance carriers like Lloyd’s of London on Wall Street in New York City. “I expected some pushback, but these maritime insurance companies were happy to have someone look through their records,” he said. The exact number of shipwrecks off New Jersey may never be known exactly – even the 3,000 figure may be low – but the old records provide a glimpse into the treacherous occupation that mariners once faced. New Jersey’s coastline, in the 1600s through 1800s, was sparsely populated and largely uncharted. Many of the wrecks occurred off the generic “Squan Beach,” Nagiewicz said, though their exact locations could have been anywhere within 10 to 15 miles of their written location. Some were never found. The book includes photos taken by Shorebeat of the suspected wreck of the Ayreshire, discovered in Normandy Beach, Brick Township, during the installation of a steel sea wall in late 2014. 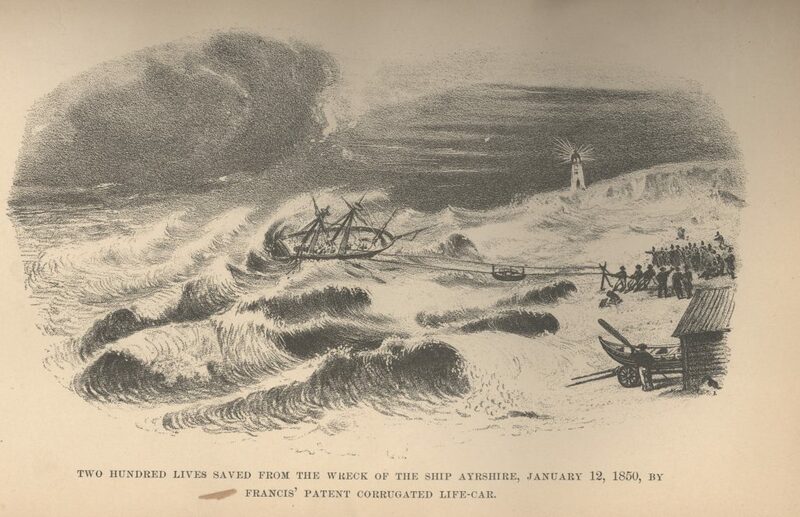 That wreck was particularly famous – even though its location was unknown – because it represented the first time a new lifesaving technology was used to bring people ashore. The ship had been carrying immigrants from Europe to the United States. 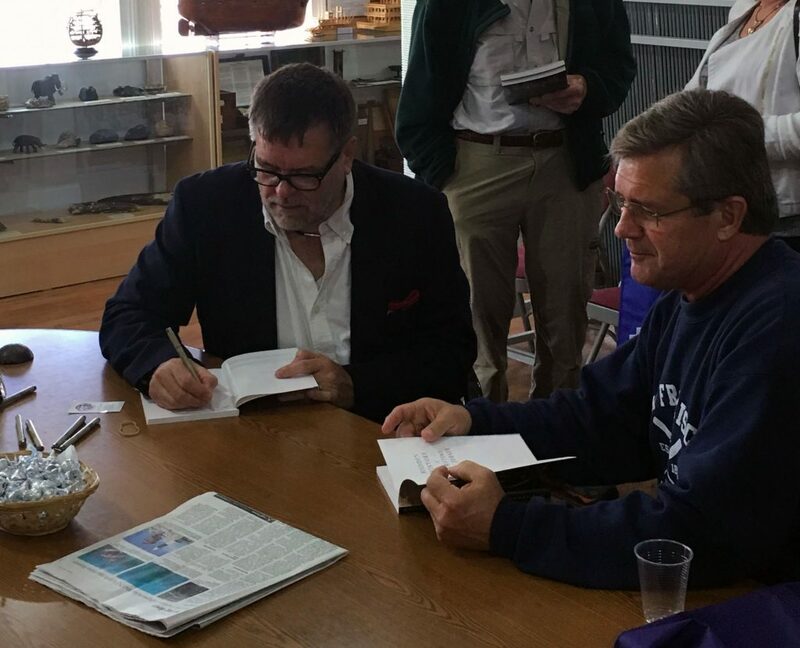 Nagiewicz himself said the most fascinating story he learned while writing the book was of battles between privateers and British merchant ships in the Mullica River, south of Long Beach Island. Writing the book led to the discovery that there may well be Revolutionary War-era wrecks still lying on the bottom of the river today. In the coming years, Nagiewicz will begin surveys of the river with his students in a quest to find them. “It’s a side of New Jersey maritime history that hardly anybody talks about,” he said. 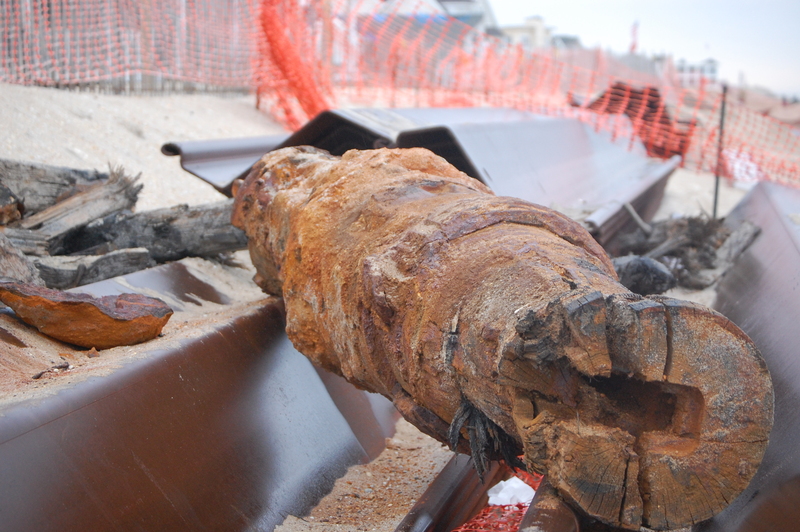 New Jersey’s maritime war history continued into the 20th century, with two hydrogen bombs mistakenly dropped into the ocean off Atlantic City in 1957, and German U-Boats frequently patrolling not far off local beaches during both World Wars. The book takes information that is of interest to divers and explains it in a way that can help stoke the imagination of any New Jersey beachgoer, boater or history buff. “I wanted people to realize that when you’re sitting on the beach or enjoying a cocktail in the summer time, there’s a lot more going on out there than just the pretty sunset,” said Nagiewicz.